Here's a Luther quote from the book, Henry O'Connor, Luther's Own Statements Concerning His Teaching and Its Results: Taken Exclusively from the Earliest and Best Editions of Luther's German and Latin Works (1884), p. 55. "I think it must needs be the case, that those who follow the Gospel (literally 'who become evangelical'), should be worse after (receiving) the Gospel than they had been before, not on account of the Gospel, but on account of the people who so abuse the Gospel" (Walch. XIII. 2193). This quote pops up every once in a while. It's typically used by Rome's defenders as proof of the failure of the Reformation (or something like Luther's regrets or concession to the failure of the Reformation, etc. example #1, example #2). 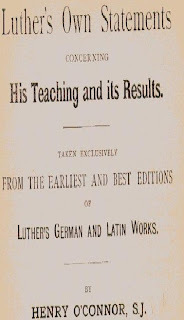 Luther's Own Statements Concerning His Teaching and Its Results is an old small anthology of Luther quotes peppered with vilifying commentary from O’Connor. The author claims to have compiled the quotes from the original sources: “Nearly two-thirds of the matter contained in this pamphlet is taken from the original editions of Luther’s own Works, as published in Wittenberg, under the very eye of the Reformer of Germany himself”(p. 3) He says “I have taken special care not to quote anything, that would have a different meaning, if read with the full context”(p.5). According to O'Connor's translation, people who "follow the Gospel" are worse after "receiving the Gospel." That part makes sense. What doesn't make sense is that this state of being "worse" isn't the fault of the Gospel, but rather the fault of those who "abuse the Gospel." We'll see below that the reason this doesn't make sense is because in his translation, O'Connor did not capture the essence of the context. Despite his attempted "special care," he missed the mark with this quote. 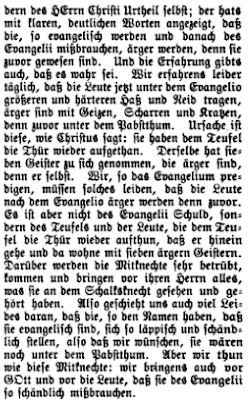 This paragraph is from Luther's House Postil sermon on Matthew 18:21-25 (Twenty Second Sunday After Trinity, 1530).Technically, Luther did not write this text. 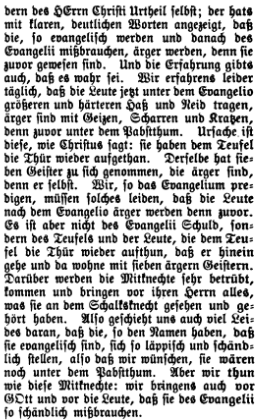 These printed words are from the notes of Georg Rörer who heard and took notes on Luther's sermon. The current English edition of Luther's Works does not include the House Postil (nor are there plans to include it as far as I know). However, an English translation of Rörer's version is available via a multi-volume Baker Books edition (1996) edited by Eugene F. A. Klug. This version is included in The Complete Sermons of Martin Luther (Grand Rapids: Baker Books, 2000). 28. The nature of the gospel is such, that those who misuse it, become more wicked than they were before. Christ himself says (Matt. 12:43-45): "When the unclean spirit is gone out of a man, he walketh through dry places, seeking rest, and findeth none. Then he saith, I will return into my house from whence I came out; and when he is come, he findeth it empty, swept, and garnished. Then goeth he, and taketh with himself seven other spirits more wicked than himself, and they enter in and dwell there: and the last state of that man is worse than the first. Even so shall it be also unto this wicked generation." There you have it, black on white! Any person to whom the gospel is proclaimed and who then misuses that gospel, becomes seven times more wicked than he was to begin with, and it would have been better for him if he had never heard the gospel. That is why I have often said that if I could accomplish things by wishing, I would wish that peasants, burghers, and nobles, who now horribly misuse the gospel, might still be under the papacy, for they are nothing but a hindrance, a shame and a disgrace to the gospel. 29. You see that illustrated here in this wicked servant too. After having experienced such great mercy, this scoundrel leaves and becomes more wicked than he had been before. This is not just my own personal judgment or opinion; it is the judgment of our Lord Christ himself, In crystal clear words he asserts that those who become evangelicals turn out to be more wicked than they were before. Experience, too, teaches us that this is so. Sad to say, we daily experience the fact that people who are under the gospel now bear greater and more bitter hatred and envy in their hearts; they are more greedy and to materialistic now than when they were still under the papacy. As Christ says, The reason for this is that they have again opened their heart's door to Satan, and he has brought with himself seven other spirits more wicked than he himself is. We, who proclaim the gospel, must simply put up with the fact that under the gospel people become more wicked than they were before. But it is not the fault of the gospel, but of the devil and those people who return to serving Satan, allowing him to reenter their hearts and rule there along with sew other, more wicked spirits. This really depresses and angers the rest of the servants, so they come and report to the king the sordid conduct of their fellow servant. We, too, experience the same kind of disappointment when those who have the reputation of being "evangelical" conduct themselves so disgracefully and abominably that we really wish they were still under the papacy. But here we follow the example of these fellow servants by bringing their disgraceful abuse of the gospel to the attention of God and of the public [The Complete Sermons of Martin Luther vol. 7 (Grand Rapids: Baker Books, 2000), p. 141-142]. The people who become worse because of the Gospel is not an all-inclusive statement as O'Connor insinuates. The people in view here are not Christians. Luther has in mind "wicked people" of the "godless world." He says of these people, "For such people there is not forgiveness" (p. 140-141). "[T]he gospel is a message for the depressed, for people with a guilty conscience, not for those who deliberately sin against a gracious God" (p. 141). Like the judgment of the wicked servant in Matthew 18, "the Lord God will soon bring down upon our false 'evangelicals' plagues, hard times, and war" (p. 142-143). "[Y]ou who are misusing the gospel so shamefully will meet a different fate from the one that is reserved for us, whom you are mistreating and depressing so severely" (p. 143-144). What provoked O'Connor to so abuse the context? Speculating, I would suggest it's his zeal to defend Rome at all costs. For O'Connor, "Luther can only have been a Reformer chosen by Almighty God, if his teaching caused an increase of virtue and a decrease of vice" (O'Connor, p. 50). This is an unproven assumption, and it isn't even Biblical: many of the prophets of the Old Testament demonstrate that in their attempts to reform Israel by proclaiming the truth of God, they often were not heeded and the nation of Israel grew worse.